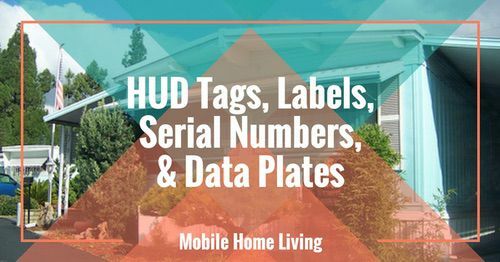 This mobile home renovation is awe-inspiring! 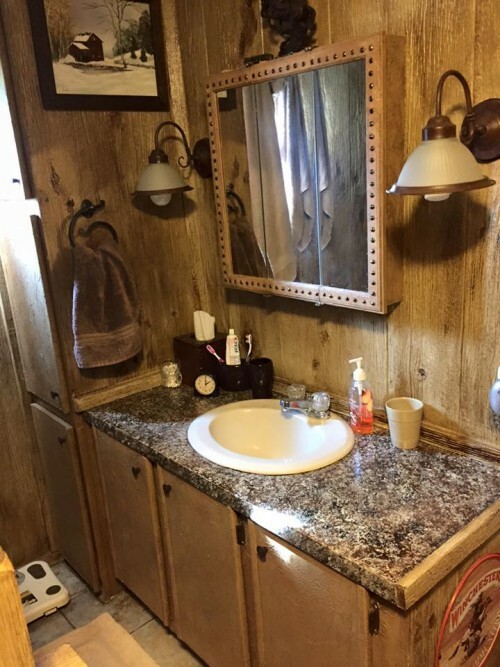 In January 2013, Scott and Connie Winebarger moved a 1981 Commodore single wide onto their property in Ronda, NC and quickly began a mobile home renovation like none we’ve ever seen. 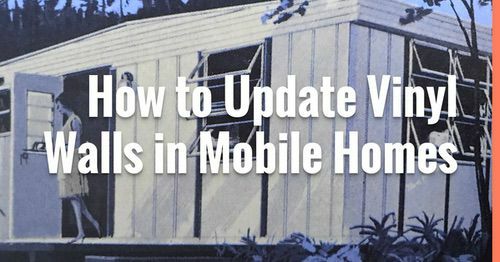 Read this if you are Trying to Decide Whether to Buy an Older Mobile Home and Remodel It? 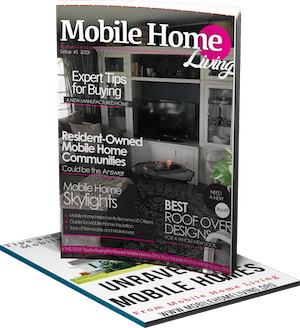 This isn’t just any ordinary mobile home renovation. Connie is an extremely talented professional faux painter and Scott is a licensed electrician. 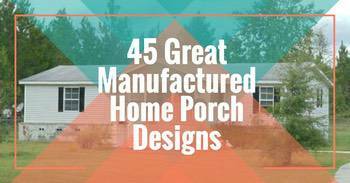 Together, they have managed to create a home that puts their unique talents on display. 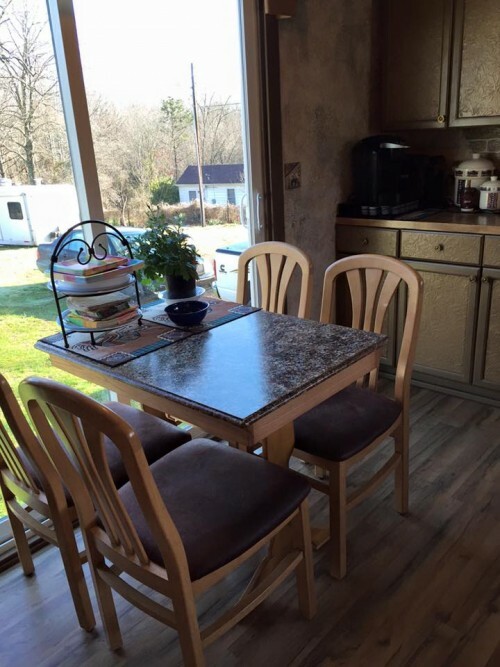 This mobile home renovation was an exciting time for Scott and Connie to use their unique skills. Connie states, “We feel a huge sense of accomplishment and satisfaction in knowing we are the ones who have done it.” After you see the end results, you’ll see they have plenty of reason to feel accomplished! The creative couple gutted, renovated, and made each space their own one room at a time. They focused on updating the home’s systems first: plumbing, heating and air, and electrical were all replaced. After that, they began creating a rustic, yet modern, western style home that is as gorgeous as it is unique. The living room went from ordinary to extraordinary! 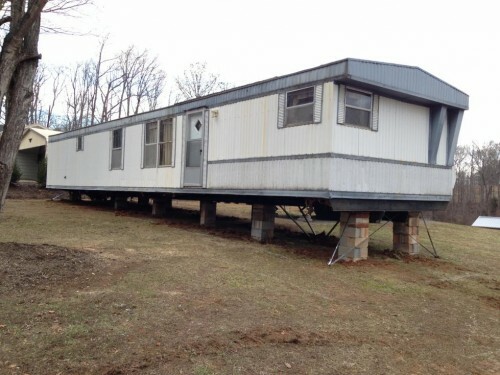 Words can’t really do this mobile home renovation much justice so we’ll just show you the before and after images. 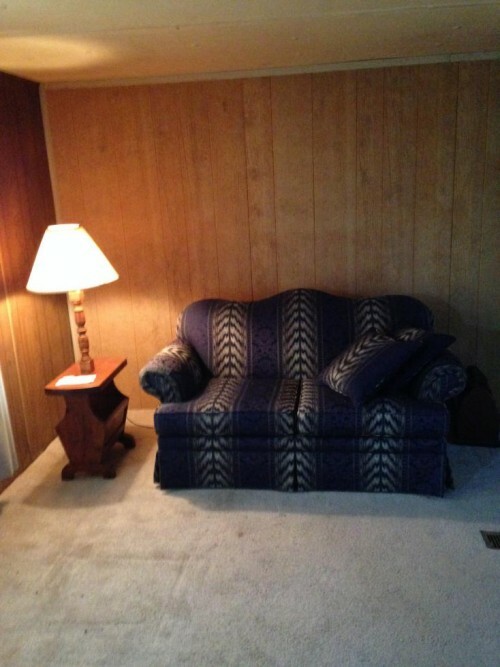 The old paneling along the back living room wall was replaced with real wood. 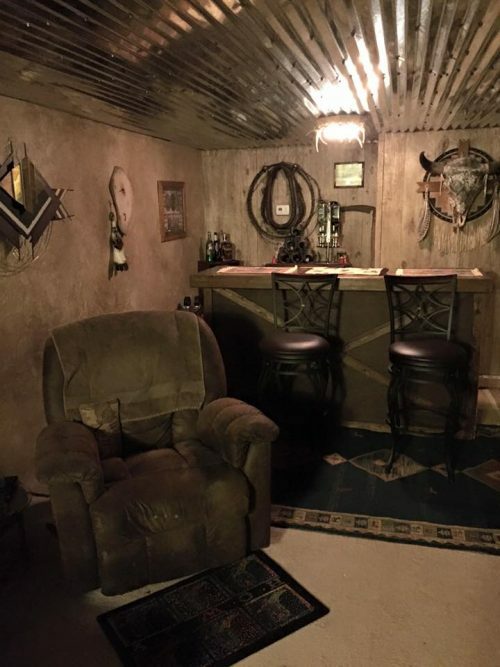 The side walls were faux painted with a similar rustic Western theme. 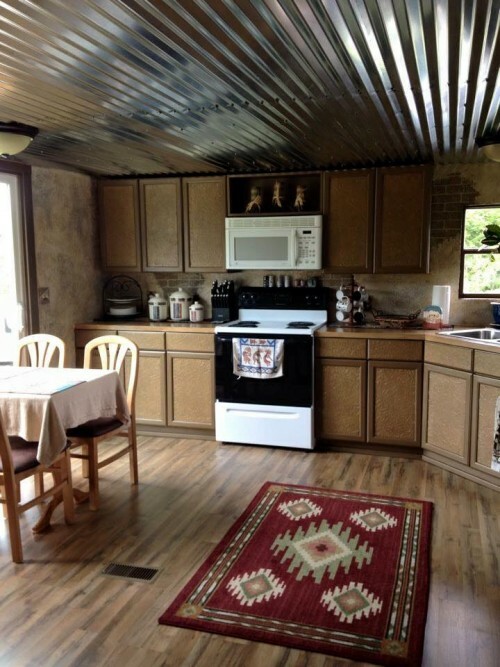 Finally, glossed corrugated steel was used on the ceiling throughout the mobile home. Combined with the decor and furnishings, this entire home is a perfect representation of a charming rustic, old West General Store! Reclaimed lumber frames the electric fireplace and flat panel TV. The kitchen is just as outstanding as the living room! The walls were done using an Italian Breakaway Plaster, which gives a look and feel of being in an old building. 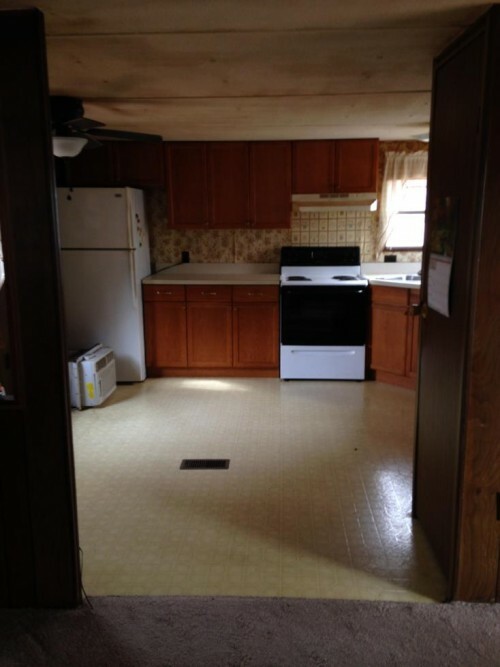 The refrigerator was moved from its original spot creating more counter and cabinet space. The old stove hood was replaced with a microwave oven. Real wood replaced the original flooring. Before the update, the room lacked a certain charm but Connie and Scott took care of that! The bedroom window along the back wall was removed and replaced with old barn wood. Reclaiming old wood is becoming more and more popular. The use of reclaimed wood creates a natural and warm look while being completely eco-friendly. Barn wood warms up a space like no other material can! 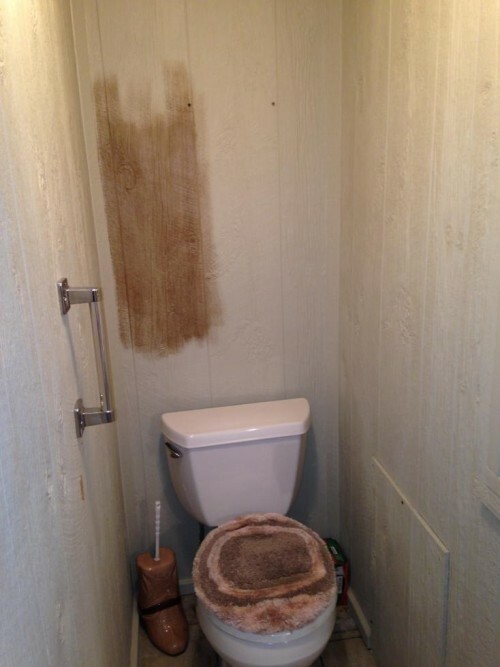 The walls in the bathroom had been replaced with a rough board and painted white. 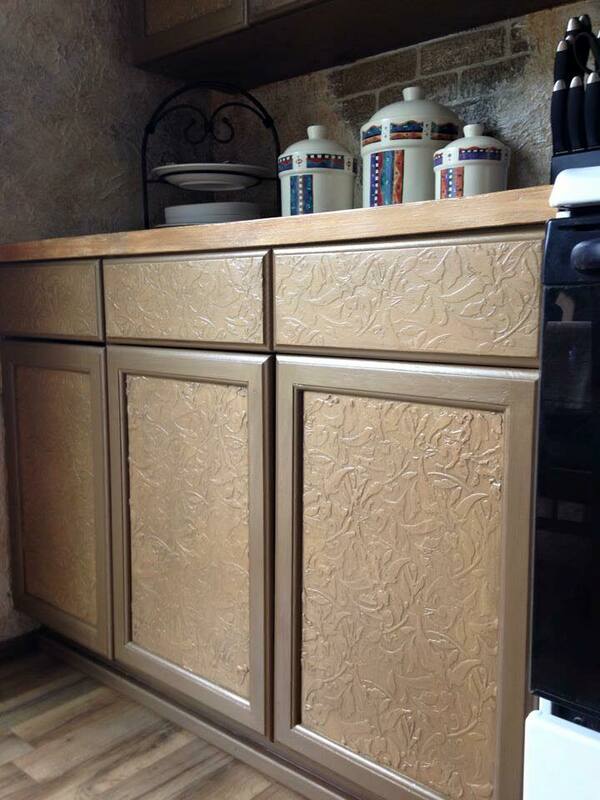 Connie quickly stained it to continue the rustic barn wood look. She continued the look with a painted wood-grain treatment on the remaining walls. Connie and Scott may have finished the existing rooms but they are far from finished with their mobile home renovation. The couple hopes to add a 14′ wide addition to the entire length of the mobile home. It will house an additional bedroom, bathroom, laundry room, dining room, and a covered deck. After the addition, the home will be wrapped in board and baton to continue the rustic western look that she has perfectly mimicked so far. Right now, the outside of this home currently looks like any other 1981 single wide but that’s only because Scott and Connie haven’t gotten around to the exterior yet! Could you imagine walking up to the door and then seeing the interior? Another perfect example that you should never judge a book by its cover! We’ll be sure to share the exterior mobile home renovation as soon as Scott and Connie get finished. I can guarantee it will be as amazing as the interior! A huge thank you to Scott and Connie for letting me share their awesome home (and for being patient with me)! 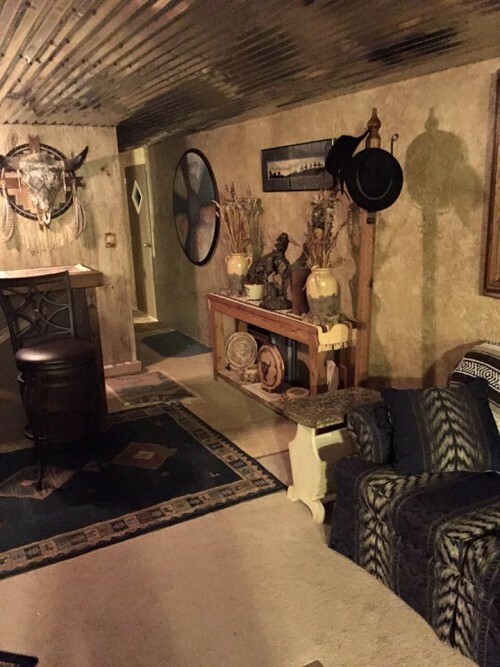 Be sure to visit Connie’s website, Faux Designs by Connie, for more great examples of faux painting and if you’re looking for a faux painter for your own home projects in the Ronda, NC area definitely give Connie a shout – her talent is amazing! WE RECENTLY BOUGHT A MANUFACTURED HOME…..OUR INSPECTOR FAILED TO TELL US ABOUT THE CRAWL SPACE MESS FROM BEING EXPOSED TO THE ELEMENTS AND ANIMALS……WE ARE HAVING A HARD TIME FINDING RELIABLE REPAIR MEN TO COME OUT AND GIVE US AN ESTIMATE ON REPAIRING THE DUCT WORK AND GETTING IT READY FOR THE WINTER MONTHS AHEAD. ANY SUGGESTIONS?? Hmm, the ducts, insulation, and belly wrap definitely need repaired before winter. Call your local manufactured home dealerships and ask for referrals. 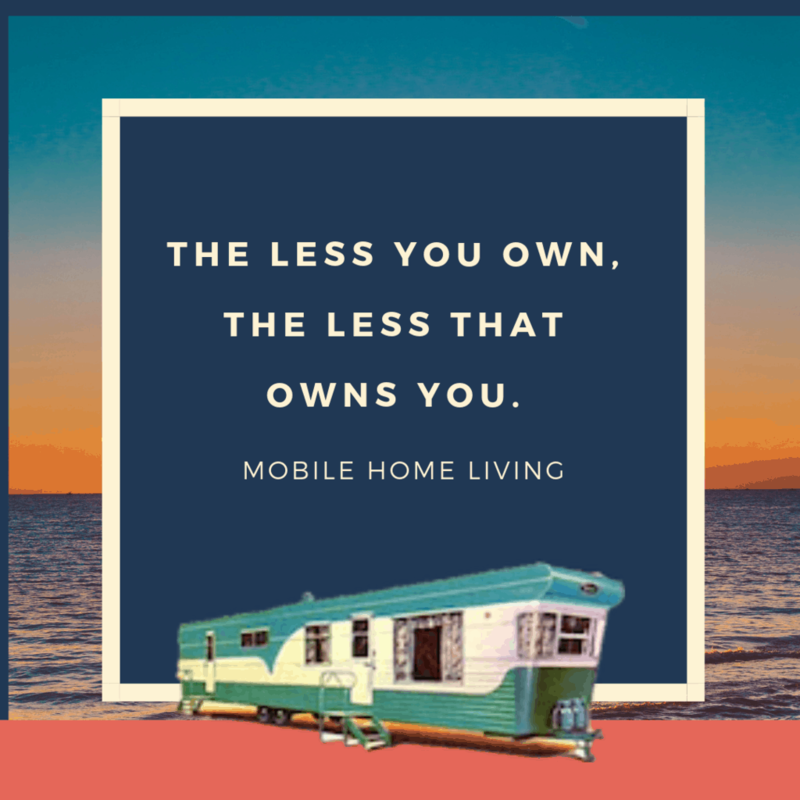 You can also call your local mobile home supply house. Last case scenario could be adding a help wanted listing on Craigslist. 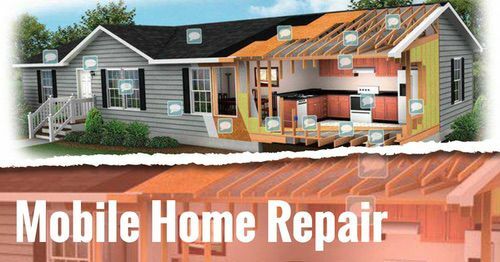 If it’s just critter damage you may not need a licensed contractor of any kind (HVAC, Electrical, etc. ), just an all-around handy man could do it. As long as there are no ‘structural’ issues it isn’t too difficult to repair duct work, add insulating foam boards or the pink stuff and putting a belly wrap up (though the belly wrap will will be easier if you have a couple of helpers). 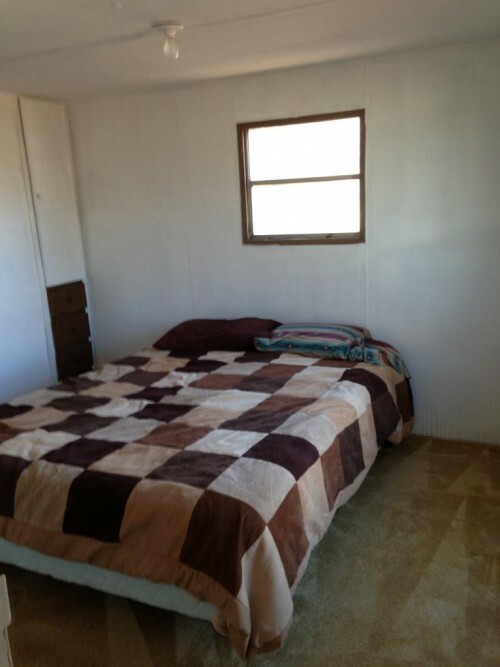 This article about insulating under your mobile home with foam board may help you a bit. Click here. 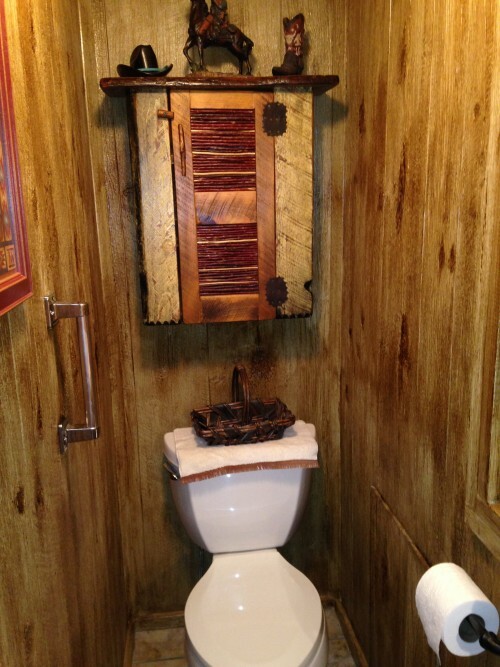 Hello I am wondering what kind of wood was used in the bathroom to give it that rustic look? 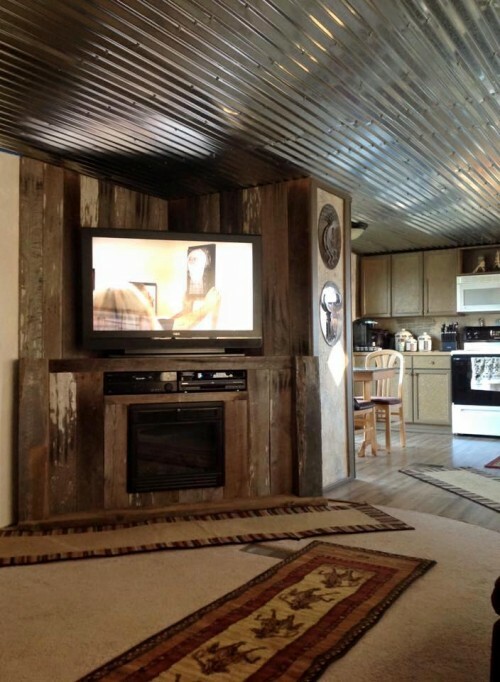 I’m pretty sure she used a pine paneling and then stained it to give it that gorgeous rustic style. The paneling is available at Lowe’s and Home Depot. I can imagine rustic skirting and a wrap around covered deck that starts at the front door and ends at the kichen sliding doors. Wow what a lot of work, if only I were younger. Great job. Hello Crystal. I just learned of you today…. 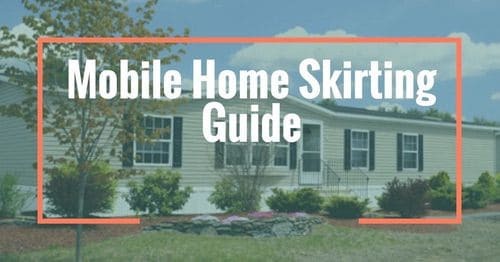 (about two hours ago actually) while educating myself on mobile/manufactured homes as I am in the infant stage of possibly buying one and I have to tell you that I AM IMPRESSED with you. I can not get enough of your wisdom and passion. You are truly an inspiration and I look forward to reading much, much more about you and gaining more knowledge from you and I just thought that you should know that. Have a GREAT day Crystal. Oh Wow, thank you so much Richard! It means a lot to me to hear that and I appreciate you taking the time to comment it. You are more than welcome and deserving Crystal. I don’t usually take the time to write many comments unless they have a serious impact on me. I have commented on a few of your articles so far actually. And I look forward to reading so much more. Keep up the great work. And yes, I agree…..Buy a cheap one and re-model it yourself for LESS!! Have a GREAT day Crystal. Is there any way we can follow this? I like what they are doing with the place. She doesn’t have a blog but I’ll definitely try my best to share all her updates. Thanks so much! behind the scenes worker and finisher. Together they do wonderful jobs! What a fabulous home! 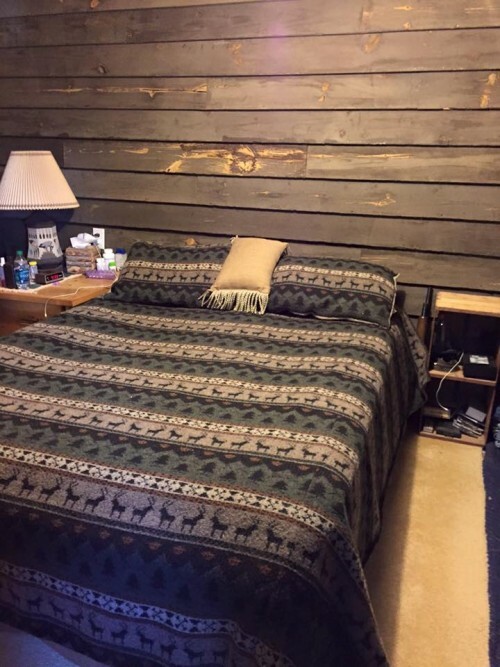 Not only because our own master bedroom/bathroom have an Old West theme…but because Scott and Connie have the vision, and the creativity, to “build” a home that reflects their personalities without owing the bank for the rest of their lives. I was going to make a list of the things I liked but then I figured a list of the things I didn’t like would be shorter…and then I realized that there is NOTHING I don’t like about this! We have an old horse collar and I haven’t figured out where to hang it…now I have an idea.